Welcome to the Feed Zone. Grab a musette and sit down for a nourishing snack of Tour de France news, views and gossip from our team out on the road. The last time a rider won the green jersey without scoring a single point in the opening sprint stage of the Tour de France was in 1993, when Djamoladine Abdujaparov was out of the picture on day one but in green come Paris. Mark Cavendish’s crash on the run-in to Rotterdam meant he missed out on the points while Thor Hushovd, his chief rival picked up 26 points after finishing third. Hushovd will hope to turn the screw when the race hits the cobbles but already the points competition is wide open. It won’t really settle into a pattern until later this week. Cavendish managed to keep his cool when provoked by some fans after the stage in Brussels. It’s not the first time he’s heard negative shouts from spectators. Before the Tour, he told CW magazine about an incident in last year’s Tour. “I was going up a climb in the Alps, the first of the Saint-Bernards [the Col du Grand Saint-Bernard on stage 16] and there was this guy perched on a rock, a British guy. I’d won four stages and everyone was shouting ‘Go on Cav’ or ‘Good luck’ and this one guy shouted ‘Come on Cav, it’s not that hard’. The Tour began with 197 riders. Xavier Florencio was withdrawn before the prologue by his Cervélo team when management realised he had used a cream containing ephedrine to treat a problem in the saddle area without getting it cleared by the medical staff first. Two riders crashed hard in the prologue. Manuel Cardoso, the Portuguese rider with the Footon-Servetto squad, suffered face and head injuries but picked himself up to cross the line in a time six minutes slower than eventual winner Fabian Cancellara. Although he was not eliminated for finishing so far behind, Cardoso was unable to start stage one. Mathias Frank of the BMC Racing squad also crashed in the prologue and, although he completed the stage, he was unable to start on Sunday. HTC-Columbia lost a valuable team worker after Australian Adam Hansen crashed 40 kilometres into stage one. The race doctor suspected a broken collarbone but Hansen refused to climb off. Instead he rode to the finish despite the pain. However, an x-ray at hospital later showed he had broken bones and he was unable to start stage two. Team Sky’s pre-Tour press conference on Friday was over almost as soon as it began – and a large number of reporters missed it because of traffic jams around Rotterdam. The press conference was scheduled for 4pm at the team hotel in Spijkenisse, a 20-minute drive from the area of Rotterdam that’s hosting the prologue. But, with Holland’s football team kicking off their World Cup quarter-final against Brazil at the same time, it seemed that half of Rotterdam was heading home from work early to watch the match. The 20-minute journey took the best part of an hour and a sizeable number of journalists missed the start. When they did arrive, at around 4.10pm, the press conference had already broken up into little one-on-one interviews. We gather that a grand total of four questions were asked from the floor before things were wrapped up. One has to wonder whether there were any questions Dave Brailsford was keen to avoid being asked in an open forum. Who takes a dog to the Tour de France and lets it off the leash? Around 55km into stage one, a dog ran into the path of the bunch, forcing riders to swerve to avoid it. The poor bewildered animal looked startled and if you watch the footage it looks as if its tail may have been ridden over. The ripple that went through the peloton led to David Millar, Ivan Basso and Levi Leipheimer hitting the deck. If you read a quote from Lance Armstrong during this Tour de France you may think he’s conducted a press conference or spoken to reporters outside the team bus, as many riders do. Not so. Every afternoon in the press room there is the unedifying sight of a crowd of journalists gathering round a laptop owned by Radioshack’s press officer, Philippe Maertens. It is Maertens who interviews Armstrong and records what he says, then plays it back to the journalists who dutifully scribble down the quotes. There is, of course, no opportunity to ask any ‘tricky’ questions. That’s transparency for you. Other teams do, of course, issue quotes on behalf of their riders but that is in addition to opportunities to speak to them face to face. With Saturday’s prologue starting so late in the afternoon, some of the reporters on the British national papers faced a race to get their copy in for the first editions. Many had to write ‘holding pieces’ based on events earlier in the day. However, even the early deadline is no excuse for calling the winner incorrectly, as the Mail on Sunday did. 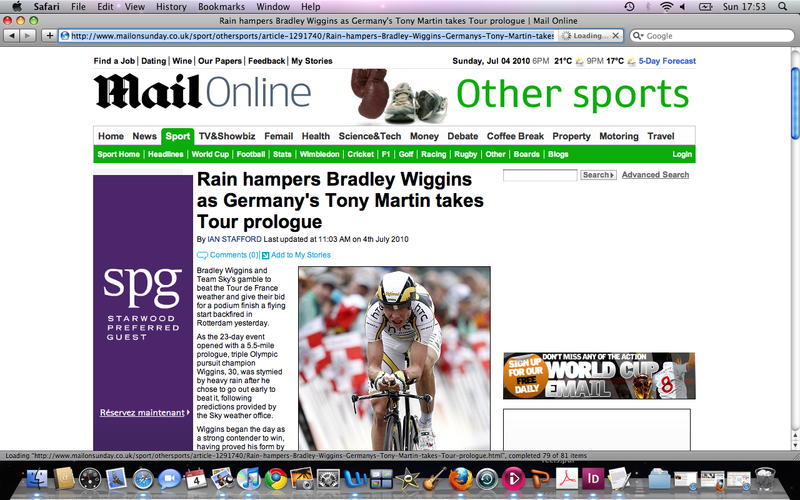 Their reporter filed his copy before Fabian Cancellara had finished his ride and the article on the Mail‘s website was headlined: Rain hampers Bradley Wiggins as Germany’s Tony Martin takes Tour prologue. By Monday morning, the website had still not been updated. Well, Germany or Switzerland, pretty much the same thing as far as the Mail is concerned. Fan 1: Yeah, of course, it wasn’t ever the plan for him to go for the win in the prologue. Fan 2: You said yesterday you thought he’d beat Cancellara. Credit to Team Sky’s willingness to adopt a more inclusive approach after the mild criticism of the ‘wall’ employed at the Giro d’Italia in May. Then, the riders warmed up for time trials behind a 7ft black wall, away from the gaze of the fans and media. The idea was to create a ‘sterile zone’ to minimise the distractions as the riders warmed up. However, in Rotterdam, Team Sky’s approach had softened. There’s still a wall, but it’s much smaller and it’s see-through so the fans can watch the riders. Before the prologue, Sky’s riders warmed up inside the mechanic’s truck, which looks like the sort of thing a Formula 1 team would use. A TV screen was rigged up so that people could watch the riders go through their warm-up routine. We understand Team Sky’s decision to get rid of the old Berlin Wall-style barrier was because they recognised it did not project the friendliest image. During stage one, CW passed some fans with a banner that read: “Believe In Jesus” with the word “Jesus” crossed out and “Lance” written underneath it. Hmmm. Sylvain Chavanel, the Quick Step rider who animated the stage to Spa by getting in the eight-man break and then going on to win and grab the race lead, is on the look-out for a move back to a French team, according to L’Equipe.